I don’t frequent the town where my uncle’s funeral took place so I totally missed my grandmother’s old home when the funeral procession passed by on the way to the cemetery. I felt bad when my cousin told me. I’d recognized the hill but I was looking at the wrong side of the road, while driving – all the while fearing I would get cut off or lost on the way. Whether it’s driving through a red light or trying to stick close to the car in front of me, it’s difficult sometimes to stay in a funeral procession. It only took Joseph M. Bernaudo nine years as a funeral director to realize guests could use a little help staying in line during funeral processions – and he’s created a smart phone App aimed at making it easier. 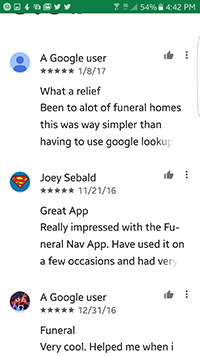 Bernaudo rolled out the Funeral Nav Mobile App in the fall of 2016 and it’s now helping people navigate funeral processions in Long Island, Iowa, Staten Island and New Jersey. “The most public display of the loss of a life is still the funeral procession,” said Bernaudo, 29, a native of Hicksville in Long Island. “When there’s something that comes across your table often enough in anything you do professionally, you start to ask yourself, ‘are we doing things correctly?’ Bernaudo said. He’s seen it during his time as a funeral director. People get cut off by motorists unconcerned with funeral processions. Some people get stuck at a light. Folks attending funerals often travel from out-of-town – making it even easier to take a wrong turn and get lost. “It’s very upsetting if you’ve ever been in the procession and not leading the way,” Bernaudo said. Bernaudo – with the help of a developer – conceived of the Funeral Nav App and is working to market the capability to funeral homes concerned with the travel of guests in the procession. It’s a product marketed to funeral homes who can add their facility’s logo to the view, a link to the funeral home’s website and a link to the phone number of the Funeral Home. Funeral guests simply have to download it like any other App they place on their smart phones. The App details the travel route in real-time. Google maps, Bernaudo said, typically choose the most efficient route to a site. But funerals processions often take longer routes for one last drive by the home or other important site. These paths aren’t the ones Google maps or other GPS units will take you on. The Funeral Nav App keeps track of the lead vehicle. “With smartphones today, they have the ability to track you. It turns that into layman’s terms and broadcasts your exact location,” he said. Bernaudo is providing a detailed brochure funeral homes can display if they wish, one he believes will demonstrate concern for guests. The App itself is free for funeral guests. It doesn’t take up a lot of space on people’s smartphones and, of course, guests can use then uninstall it after a funeral. And, as many already know, users can simply uninstall it after you get home from the funeral. 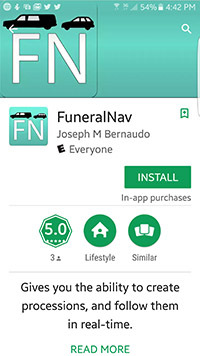 The business end of the Funeral Nav App takes place between Bernaudo and the Funeral Home – and he’s providing a free trial for those interested in giving it a try.